What is your vision as DGAFMS? I have tried to bring in the IT imprint in AFMS and sincerely believe in aligning with the Prime Ministers Digital India campaign. In times to come, IT will have a huge impact on healthcare, particularly tele-medicine can help us in a big way to get connected with high altitude areas. Recently, with help of the Indian Space Research Organisation (ISRO) we have established 53 tele-medicine nodes, which will help us to enable medical consultation between soldiers deployed at the Siachen glacier and other forward posts along the borders. Such remote posts are cut off for several months due to extreme weather conditions, now can communicate through satellite-enabled tele-medicine nodes with the nearby tertiary hospitals. Also, Artificial Intelligence (AI) is gradually becoming an integral part of healthcare. Certain apps based on AI help in the stress-detection system by analysing the heart rate, muscle tension, blood pressure and detect the mind of an individual. We are also looking out for such apps which can be used in AFMS, I believe that it will help in assisting the medical needs. Apart from implementation of technology I also make sure that there is constant training programmes conducted for medical professionals in different locations and terrains throughout the year. 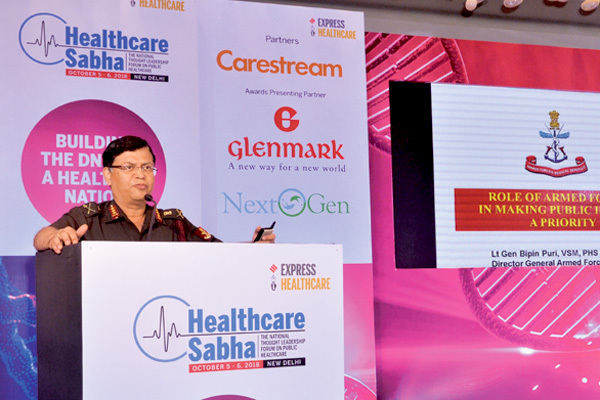 Every year, the armed forces organises its annual medical conference where you deliberate on various topics. Can you brief us about it? The Armed Forces Medical Conference is held every year at Armed Forces Medical College, Pune in the month of February to discuss matters of medical research, technical training and scientific publication. We discuss on various issues that the armed forces is confronted with and also look at the upgradation of skills, competency, infrastructure and facilities for the medical fraternity. The conference conducts the Armed Forces Medical Research Committee Meeting, where we discuss on medical research in the Armed Forces the discussion is focused towards making the soldier fit in all respects through preventive, curative and rehabilitative services in order to have a healthy force. The meeting is a conglomeration of medical experts of the three services where they interact and integrate their efforts to further military medical research. Every year we get 200 research projects on military medicine out of which we sanction about 100 projects, as we have a limited budget. Armed Forces Medical Academic Council Meeting is also held as part of the conference to discuss all matters pertaining to UG, PF and super-specialty training. The upcoming conference is scheduled for February 2019 . What is the need and intent behind starting a DNA profiling centre and repository at AFMC? How many samples have been collected so far? Establishing the identity of the deceased is not a legal necessity but also a moral responsibility as it has emotional implications from the point of view of the next of kin and other family members. Usually the methods employed for establishing the identity of the deceased are examining the personal belongings on the dead body, studying the identification marks, comparing photographs etc., become futile in circumstances where there is extensive mutilation, disfigurement and decomposition of the body. DNA profiling of the available body parts is the only fool-proof scientific method of establishing the identity and thus can be done only if blood samples of all personnel are stored or DNA database is created for all. The bill on this project is tabled in the Parliament and it isn’t cleared yet. Hence, this initiative of establishing a DNA profiling centre and repository at AFMC, Pune has been undertaken as a pilot project. The process of blood collection of high risk group amongst the Armed Forces is under progress and a large number of blood samples have been collected. If the bill is passed we will do the profiling of each and every armed force personnel pan India. What is your take on the Ayushman Bharat – PMJAY scheme? Ayushman Bharat is a mega healthcare campaign. In regards with the programme we have had a discussion with the Ministry of Defence and Ministry of Health and Family Welfare (MoHFW) on AFMS can help in implementing the scheme in far-flung border areas where there is no medical infrastructure and how we can support them. The central government is increasing the count in medical seats for the AFMC, from 130 to 150 seats. Armed Forces Medical College (AFMC) already had the infrastructure and resources required for 150 UG seats. Increase in seats granted by Ministry of Defence (MoD) will ensure optimal utilisation of resources. It would also make available additional well-trained doctors for the armed forces. Your opinion on introducing robotic surgeries on the battlefield? What is your top-most priority on the battlefield? What kind of injuries are common and how can it be reduced? Early intervention and damage control to save life and limbs is of prime importance in combat situation battlefield surgery. Definitive management is deferred till the patient is evacuated to a proper centre. We do have a Da Vinci Robot surgical instrument which performs surgeries with superior precision and control in the Army Hospital in Delhi, it is used extensively. Soon, we will be procuring three more such robot surgical machines in Command Hospital Pune, INH Asvini Mumbai and Command Hospital Bangalore. I believe that robotic surgery is the way forward when it comes to minimal invasive surgery as the quality of surgery is much better and effective than laproscopic surgery. Robotic surgery requires extensive infrastructure and time to allow for the placement of ports prior to the commencement of surgery. The above is not available on field situations where surgical setups in Forward Surgical centres are not permanent structures and may be required to move depending on combat situations. In addition, the learning curve is very long and most of the young surgeons deployed on the field are not exposed to it. Projectile injuries from bullets, splinters to limb and torso are the most frequent injuries encountered. Injuries to torso can lead to fatality and it can be prevented by suitable body armour, which are strong enough to allow the soldier to perform his role without any hindrance. What are the measures taken to reduce the stress level among soldiers? How are these projects – Milap, Sahyog and Mansik Sahayata Helpline’ helping you to manage stress? The army is continuously evolving, measures to improve stress releasing mechanisms are taken. An elaborate mental health programme has been formulated since 2009. The issues of stress and strain is being addressed by the commanders in a comprehensive manner at various levels. Sessions for stress management are organised by commanders and psychiatrists at all major stations. Counselling is an intrinsic component of 22 psychiatry centres in the army manned wellness centres. Multi-pronged strategy in the form of directives, station lectures, special exam clinics with personal counselling is being adopted to reduce stress related disorders. Mansik Sahayata Helpline has been established at respective command HQ under the aegis of Comd Headquarters. This helpline is available to provide counselling services to anyone who wishes to avail them. Mental health awareness training is conducted during pre-induction training. In areas of Northern Command, psychiatrist trained psychological counsellors conduct talks during pre-induction training on stress related issues, early recognition, signs and symptoms and measures to cope. Studies on cause/issues related to suicide/fratricide are carried out from time to time and suitable educational material including short films are prepared and disseminated for education of troops. Screening tools are being developed to detect stress makers and the same will be validated subsequently. What is the significant role of regimental medical officers (RMOs)? RMOs constitute a vital asset of the AFMS. These young medical officers are embedded with troops both on field and peace locations and perform a host of important functions. They are the authorised medical attendants and medical advisers to the unit and formations they stay with. In addition to rendering treatment and advice, RMOs spearhead promotive and preventive healthcare strategies at the furthest echelon of the healthcare delivery system. They undertake training activities for trained and highly qualified psychiatrists and battlefield nursing assistants and help to ensure that every soldier can be provided life and limb saving medical care as quickly, effectively and as far forward as possible. RMOs presence in the units adds to the confidence of troops and they are often the close confidants, friends, philosophers and guides to the officers they serve. All our AFMS officers believe in service before self. AFMC was planning for a multi-national disaster management exercise, to face any natural or man- made disaster. Any update on that? A field training exercise involving ASEAN and ASEAN plus countries as part of the 3rd cycle of expert working Group on Military Medicine is scheduled in Lucknow in March 2019. A mid planning conference for the same is scheduled in December 2018. The filed training exercise will involve about 10 member contingents each from all ASEAN and ASEAN plus countries. The exercise will cover various facets of mass casualty management, aeromedical evacuation, chemical spill and healthcare evacuation camps. The aim of this exercise is to develop synergy, coordination and intra-operability between ASEAN and ASEAN plus countries in the event of natural and man made disasters. How important is regenerative medicine in military medicine and what are the recent developments? There is a fair amount of research which is going on globally on regenerative medicine. In our tertiary care centres we are looking into reconstructive surgeries and tissue engineering techniques particularly in severe burn wounds. Usually army personnel suffer large surface burns and loose a lot of skin. One of the research project’s in the Army Hospital, Delhi is on regrowth of skin, we are hopeful that this research will help and promote skin healing and reduce scarring. We are also in the process of establishing a department of genetics in the Army Hospital, Delhi and AFMC, Pune and the latter will also have a exclusive research wing,which will help in medical advancement in military medicine.